No matter what the occasion, Hayward Flowers, your local Hayward florist, is your one-stop shop for all your floral needs. Browse our wide online selection or call us for a custom bouquet to fit your needs and budget. We deliver flowers and gift baskets to Hayward and nationwide through our network of dependable florists. In a rush? Same day flower delivery is available at no additional cost. The professional staff at Hayward Flowers is dedicated to handling your order with care. ThereÃ¢€â„¢s never a wrong time to send flowers. Hayward Flowers carries a vast array of flowers in Hayward CA for every occasion, from beautiful anniversary flower arrangements to cheerful get well flower bouquets. Valentine's Day flowers, Mother's Day flowers, birthday flowers, any day will be special when you send fresh flowers! Let Hayward Flowers, a top florist in Hayward, help you create the right impression with a spectacular arrangement of vibrant flowers. If in the unfortunate instance you need to express your sentiments with sympathy funeral flowers we are here for you as well. Fresh flowers in Hayward are just a call or click away! View our assortment of gifts and floral arrangements online then place your order through our website at any time. You can also call us directly. Hayward Flowers has a wide variety of items to choose from, and if you donÃ¢€â„¢t find what youÃ¢€â„¢re looking for, our florists in Hayward can create a unique arrangement just for you. 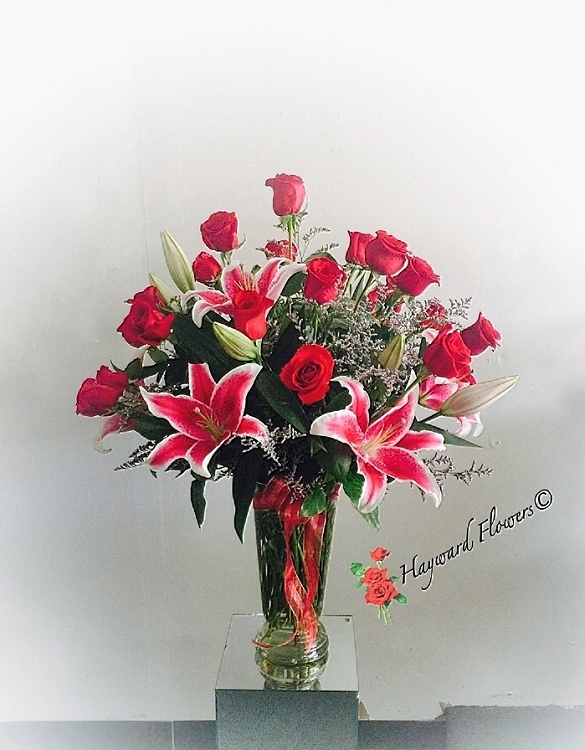 Hayward Flowers delivers beautiful flowers in Hayward and nearby communities as well as nationwide. Hayward Flowers is the premier florist in Hayward CA and has an extensive assortment of lush, beautiful plants and flowers to meet your gift-giving needs. Even if the occasion is no occasion, and you just want to show someone youÃ¢€â„¢re thinking of them, our floral professionals can create a charming flower arrangement for your special someone. All of our bouquets are attractively arranged by one of our skilled floral designers and hand-delivered to your recipients. Hayward Flowers is proud to offer the finest selection of flowers in Hayward. Beware of some floral sites, particularly those of the large national brands, which ship flowers in a box. DonÃ¢€â„¢t take away from the delight of receiving fresh flowers by leaving your recipient to unpack their own flowers and arrange them in a vase themselves. Leave it to one of the best florists in Hayward when you need to send flowers in Hayward or anywhere nationwide. Your bouquet from Hayward Flowers will always arrive beautifully arranged in a vase using the freshest flowers available and personally delivered to your recipientÃ¢€â„¢s door. Hayward Flowers in Hayward, CA provides flower delivery service to the following areas and zip codes in California: Our shop serves the following areas: Hayward, Castro Valley, San Leandro, Alameda, Oakland, and Fremont.